La Rural, an Argentine bistro named for the annual livestock show in Buenos Aires looks a lot like its predecessor, Pampa. Same imported Argentine grill (where flames never touch the meat). Same grill keeper. Same long room with candles leading to a romantically glowing garden with pin lights twinkling, empty on a chilly spring evening. It’s a quiet Monday with this new incarnation waiting to be discovered. 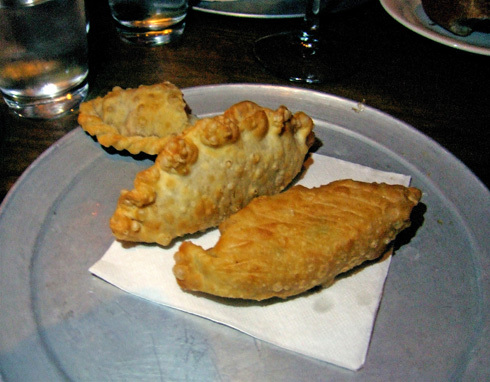 And we’re four in a sparsely populated room sharing just-baked empanadas, two big half moons to a portion. Corn and one oozing mozzarella caprese with bits of tomato and basil are my favorites, although Helene is happy enough with the spinach and ricotta. 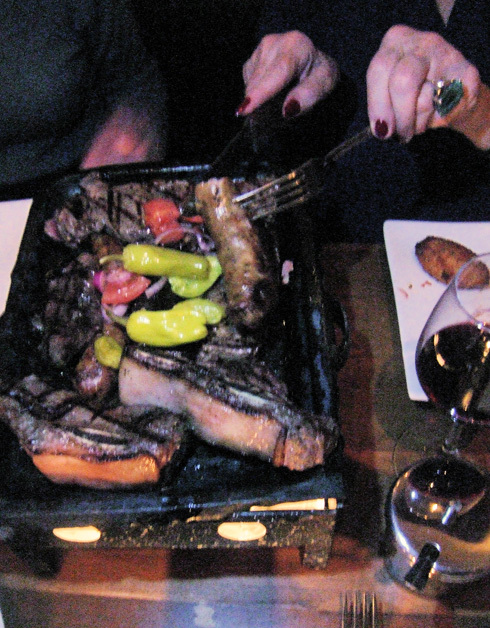 various cuts of cow heaped on a black iron hibachi-like warming stand – fabulous skirt steak, wonderful blood sausage and chorizo, really tough shell steak (as unaged grass fed steaks can be in Buenos Aires). The two of us insisted on “rare” but the short ribs might be easier to chew with a little more time on the grill. This feast comes with iceberg lettuce salad and a side of our choice - delicious cauliflower croquettes - and makes us wish we’d skipped the empanadas. The Road Food Warrior is pleased with a meaty $21 rib eye and excellent fries ($5). Tomato, eggplant and olives make a lively chorus for halibut, the fish of the day, more cooked than I would have liked. But how about a few more less pricey wines to go with these gently priced entrees? Wines at $95 and $100 with so few under $40 aren’t in the same zip code with $21 steaks. Bread pudding with dulce de leche ice cream definitely does not need a puddle of sugary wine sauce, it’s sweet enough. And my guest, who doesn’t know that dulce de leche spooned from the jar is the peanut butter of Buenos Aires is perplexed by that sticky sweet stuff rolled into his crêpes. So what’s new at this address for Pampa fans? Modish cocktails at $11, Leblon cachaca and yerba mate with mint and lime in something called Alma Guarani, and Peruvian pisco with pineapple chunks and parsley in a Viaje a Jujuy (a region in the Andes). More salads and pastas (though I’m not impressed when I see a choice of noodle and a choice of sauce – too perfunctory for me). What might tempt me back is the promise of gnocchi and half an hour of live tango on the 29th of each month. I’d try that once a week if I was seeking to entice fans up to 97th Street. And good news, there’s no need to bring cash anymore if you have Amex. Dinner only from 4 to 11 PM Monday - Thursday, till midnight Friday and Saturday and till 10 PM on Sunday.